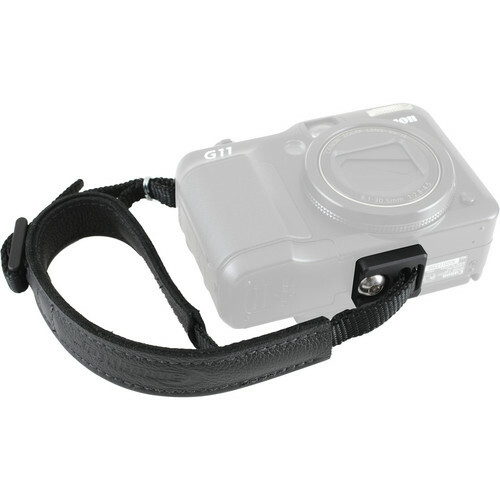 The small CamStrap from Camdapter is designed for your small point and shoot camera. When it comes to kids using cameras, you never know what will happen. They get dropped or worse, lost. With this strap and adapter combination you'll never have to worry about replacing your gear again. The aluminum adapter secures to the bottom of your camera using the 1/4-20 tripod thread using the included Allen wrench. The leather strap, bolstered by nylon, threads through both the adapter and camera lugs providing a double level of security. Once adjusted to fit your hand, it wraps around your wrist in a secure fashion. Neither the adapter nor the strap will interfere with either accessing the battery door or any of the camera's controls. As an added benefit, you'll still have room to use the original camera's neck strap for even more peace of mind. Box Dimensions (LxWxH) 10.5 x 2.5 x 1.0"
CamStrap (Small) is rated 2.0 out of 5 by 1. Rated 2 out of 5 by John H. from Not Sure About This Yet Material quality and construction seems fine. Directions are very poor. I bought this so I could carry my X100 securely in my hand ready for quick shots on the street. Even though my hands are small, I have a hard time getting my hand in the strap to grip the camera comfortably. Adjustment is difficult at best. Still a work in progress, may need to scrap for another solution.